My 5: Cha Tam Church – Ho Chi Minh, Vietnam. 1. May 2018. Another church? I hear you cry. 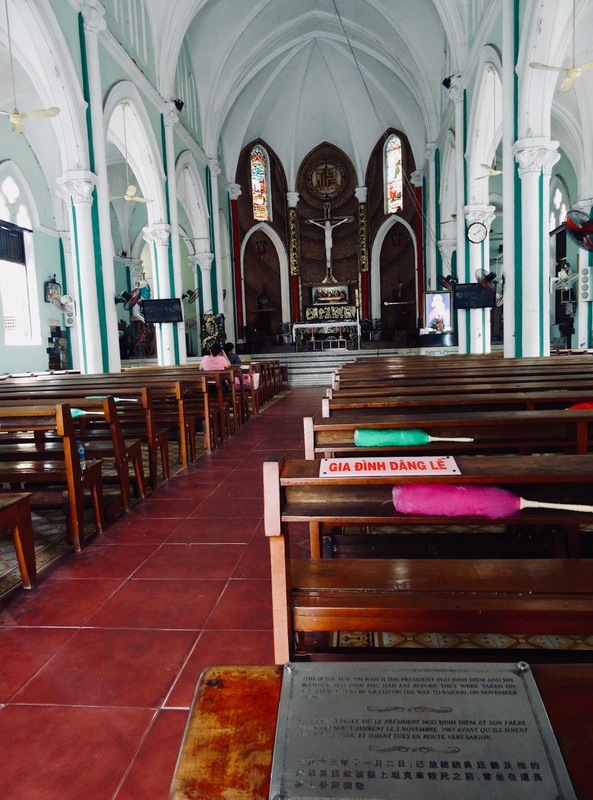 Yes, it’s yet another church, although this one has quite the backstory and features as an essential moment of Vietnam’s long, rocky road to peace. Dating back to 1902, Cha Tam Church (Church of St. Francisco Javier) was built in a gothic style with Chinese temple flourishes throughout such as yin and yang tiling. 2. May 2018. The only person I saw at the church during my visit was a saleswoman napping under a tree, her loaded bicycle of brooms, mops and feather dusters propped up against the bark. 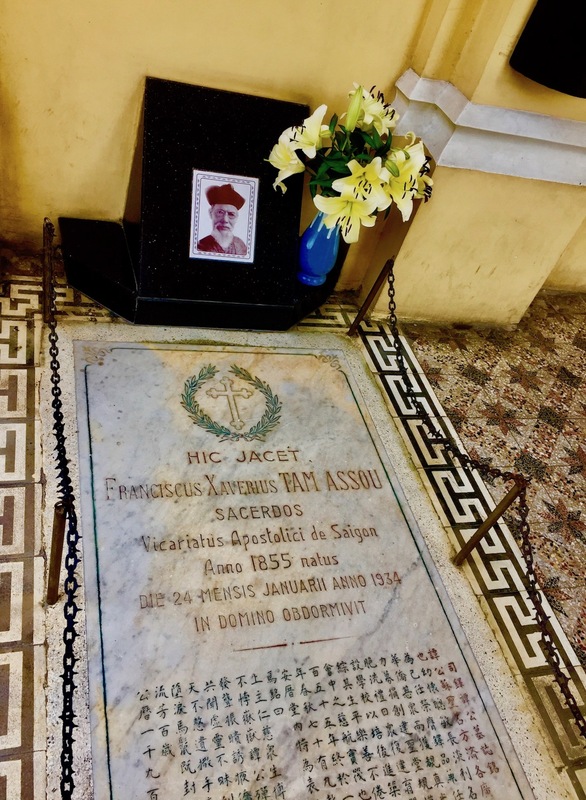 There are a few notes of interest in the church courtyard such as the gravestone of François Xavier Tam Assou, an influential Chinese-born vicar after who the church is named. There’s also a statue of him in the bell tower. 3. May 2018. 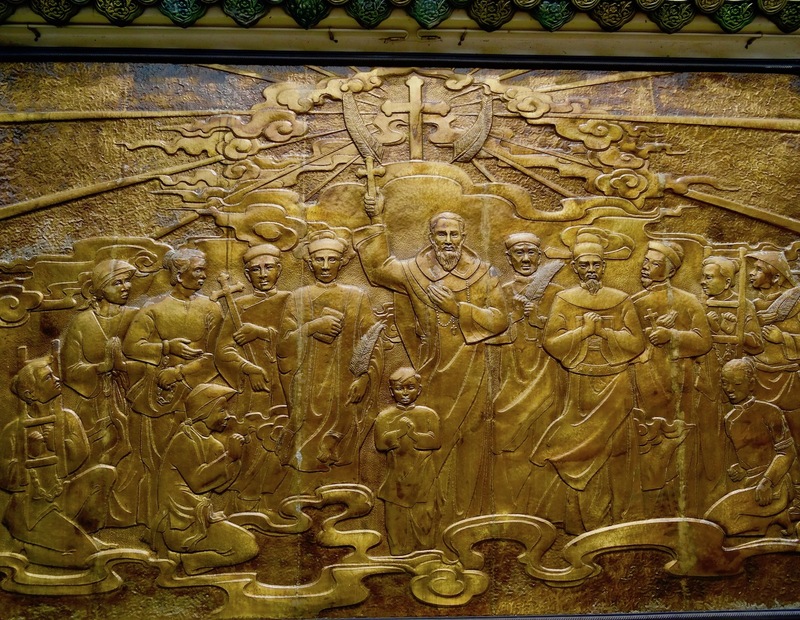 Just across from the gravestone directly opposite the entrance door stands this golden tribute to the 117 Vietnamese Martyrs canonized by Pope John Paul II in 1988. 4. May 2018. But in truth all these little details are mere sideshows to the main draw of the interior. For it was right here, marked by a discreet plaque, that President Ngo Dinh Nhu sat waiting to be captured by coup leaders on the 2nd of November 1963. He had fled the presidential palace following a coup and had been hiding out for a few days before eventually deciding to turn himself over along with his brother. Having been picked up in the church, the pair were bundled into a helicopter and shot and stabbed at close range. 5. May 2018. Cham Ta Church is located on Hoc Lac Street. It’s a little way out of Ho Chi Min’s commercial centre and took me about twenty five minutes on a Grab taxi from Ben Tanh Market. It’s free to enter and open daily from 07:00-12:00, 14:00-16:00 and 19:00-21:00. For more on my experiences in this Vietnamese city, have a wade through my many articles on Ho Chi Minh. Like these? Then why not check out more pieces from all across Vietnam. 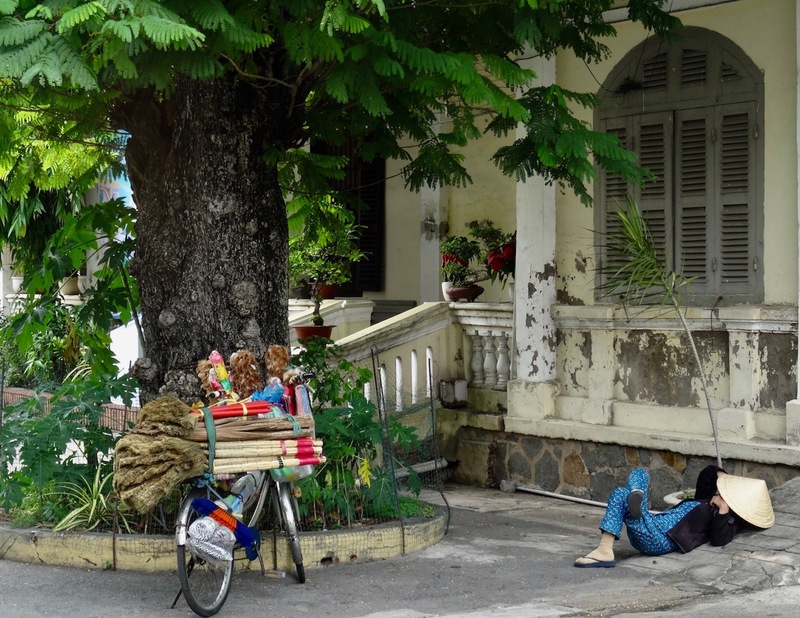 My 5: Nguyen Van Binh Book Street – Ho Chi Minh, Vietnam. 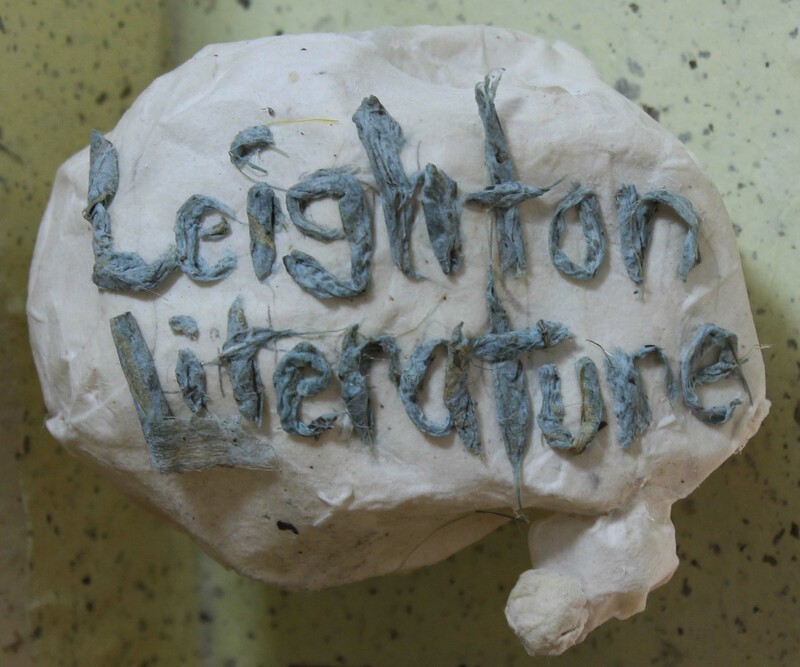 You are nothing, if not thorough in covering your travels, Leighton. Good on you. Lots of valuable information in your blog entries. Thanks Mary, this Vietnam coverage is finally, finally, finally coming to an end. About six more and it’s done – about four months after I left the country.